Midanna is a beautiful dark fawn female, with very correct and strong conformation. She is an attentive mom with lots of milk. 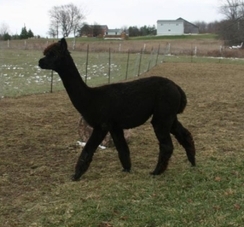 Midanna's parents are both black, and when she was bred to black, she produced a lovely black cria. She was bred to High Plains Elvis last year, hoping for a grey. Michaa is a good mom with lots of milk. All of her crias weighed 20 pounds or more at birth and had doubled their weight in one month. Michaa's first cria was a beautiful light fawn female, Minuet, sired by Lancelot. 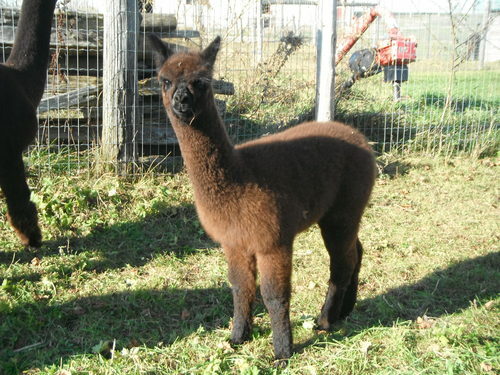 Her second cria, another female is a beautiful bay black, Milky Way, her sire is Valiant. For 2017 Michaa was bred to our youngest grey herdsire - Georgian, this was his first breeding. They produced a true black male - Midnight Sun. We were pleased with Midnight Sun so we bred Michaa to Georgian again for a 2018 cria, this time they produced a dark silver grey male - Opus. Opus has great personality and wonderful fibre. 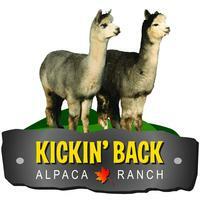 Michaa's male cria Opus is not included in the sale, once he is weaned Michaa will be able to leave the ranch. Michaa has been bred to Georgian again for a 2019 cria. 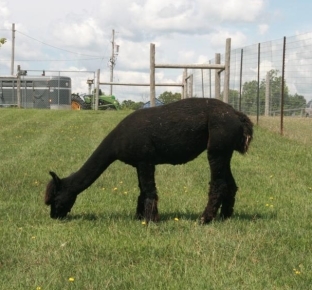 Michaa means "big" in Navajo, she weighed 22.8lbs at birth, she was our largest cria in 2011, and still is our largest to date, with two of her crias being the runners up.